Sometimes big innovations are made through small steps. 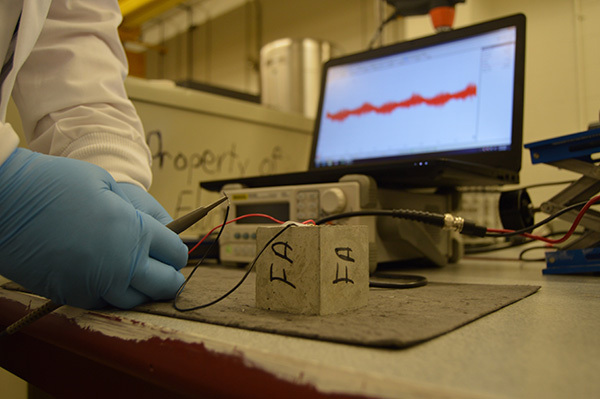 Civil engineering researchers at Purdue are developing a way to test the quality of newly laid concrete — through vibrations. Currently, quality testing for laid concrete consists of retrieving a sample from the site, taking it back to a laboratory, and then testing its compression strength. Associate Professor Na "Luna" Lu of the Lyles School believes she and her graduate students have developed a better, faster method. Sometimes big innovations are made through small steps. Civil engineering researchers at Purdue are developing a way to test the quality of newly laid concrete — through vibrations. Currently, quality testing for laid concrete consists of retrieving a sample from the site, taking it back to a laboratory, and then testing its compression strength. 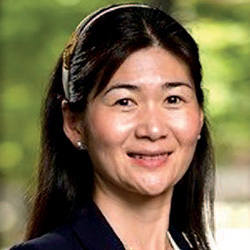 Associate Professor Na "Luna" Lu of the Lyles School believes she and her graduate students have developed a better, faster method. "The high-frequency detection and fast response of this method will provide an accurate and reliable data set of properties of concrete," Lu says. "This data will enable us to determine the optimal traffic opening time." Lu's team is developing an in situ testing method. It employs piezoelectric sensors coupled with electromechanical impedance to determine early-age properties of concrete such as hydration and compressive strength. This novel technique addresses the deficiency of current testing methods for determining traffic opening. Current methods are unreliable, inefficient and expensive — often causing premature pavement failure, construction delays and cost overruns. 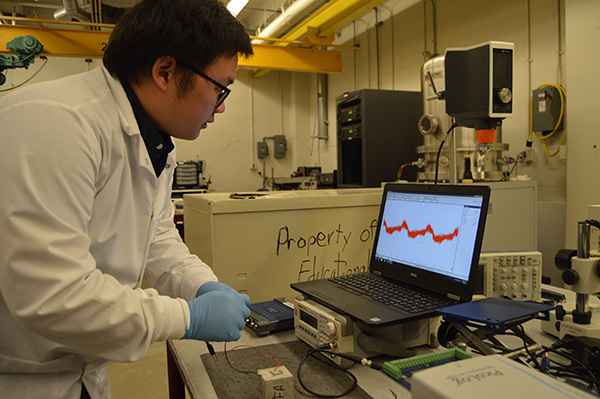 Associate Professor Na "Luna" Lu's team uses piezoelectric sensors coupled with electromechanical impedance to determine early-age properties of concrete. "Basically, we can estimate the strength of concrete by attaching sensors and using vibrations to measure," Lu says. "We hope to move our study out of the lab and test in the field next year." Advantages of the new method include a reduction in premature failure of concrete pavement and a reduced need for patching and repairing other concrete structures. The technique could lead to significant construction cost and schedule savings because it reduces testing time and the number of testing samples. Further, it can eliminate construction worker safety issues on the jobsite and accident rates in opening zones. Civil Engineering PhD student Yen-Fang Su says the team is onto something that could reshape the future of materials testing. "We're finally taking technology and applying it to old testing methods," he says. "Not only could this make testing a lot faster, it's safer, and less disruptive and destructive to traffic and roads." Once the lab testing phase is complete, the team intends to propose field testing with the Indiana Department of Transportation. Specifically, Lu's team would like to test Interstate 65 in Tippecanoe County. Civil Engineering PhD student Yen-Fang Su uses vibrations to test the strength of a concrete sample. The team plans to take its research into the field within a year.